Bouldering mats have come a long way since the beer towel. Not only do modern pads give a better landing, they are also bigger, easier to carry and boast useful extra features. This test highlights the range of options currently available. From bouldering to sport and indoors, Ocun's Oxi QC is billed as the most versatile shoe in the Oxi family. Kevin Woods reviewed the original Oxi last year, so we've asked him to rate this new addition to the line. Crack gloves aren't just for softies and North Americans, says Toby Archer, they're great for gritstone too - particularly in the colder months. He checks out two models currently available in the UK. Low impact force, long lifespan and zero sheath slippage achieved solely by perfect control over the manufacturing process. These are just some of the advantages of the new OCÚN ropes. 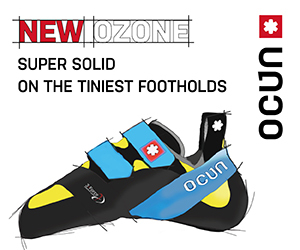 Ocun Ozone - Super solid on the tiniest holds. Featuring a redesigned heel and new colours for 2019. Low impact force, long lifespan and zero sheath slippage achieved solely by perfect control over the manufactoring process. These are some of the advantages that the new OCÚN ropes have in common.